Amy Schumer poses in the press room at the 70th annual Directors Guild of America Awards at The Beverly Hilton hotel on Saturday, Feb. 3, 2018, in Beverly Hills, California. 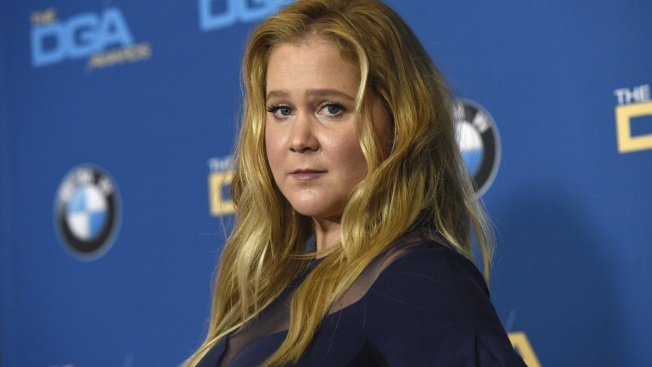 Amy Schumer says she's been hospitalized for severe, second-trimester nausea and apologized to fans in Dallas for canceling a stand-up show. She said Thursday on Instagram she and the baby are fine. The post accompanied a photo of herself in a hospital bed. The "Trainwreck" and "I Feel Pretty" star said she's been suffering from a condition called hyperemesis gravidarum, which can cause severe morning sickness. Schumer said she's been more ill during her second trimester than her first. She thanked the doctors and nurses caring for her and promised to reschedule Thursday's show at Winspear Opera House. She and her husband, Chris Fischer, announced in late October they were expecting their first child together.